My first foray into baking was either when I made Butter Cupcakes or Chocolate Chip Cookies with my sister. I can’t remember which it was now, but that was some three years back. It never really took off with me, and it was only recently that I started to bake more regularly. So I consider myself a relative newbie to baking, where measurements have to be precise, and failing to use the proper technique could actually result in disasters of varying degrees. But please don’t let me put you off baking, because as with all things, it’s really all about getting enough practice. I have tried to stick to tried and tested recipes so far, and save for some small modifications here and there, have yet to reach a level of competence where I can come up with my own. 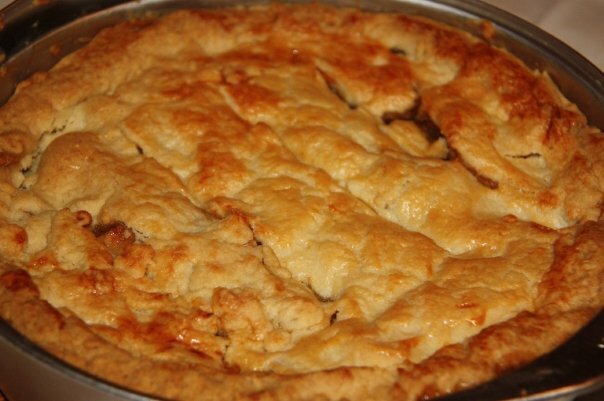 About two years ago, I chanced upon a recipe for Apple Pie in the Life! section of The Straits Times. Now, Apple Pie seemed like something so basic. I mean, how could I metamorphosize into a domestic goddess if I couldn’t even make Apple Pie, right? The recipe seemed manageable enough. 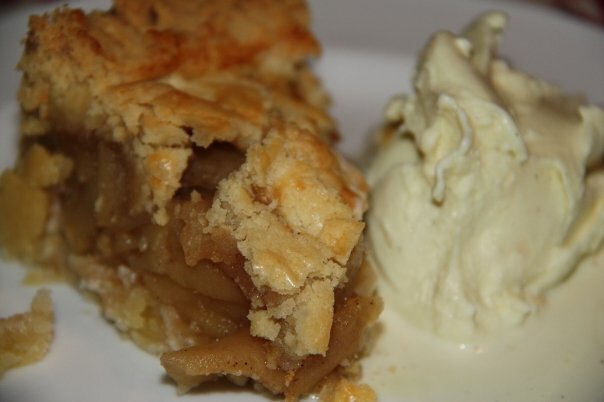 We were having family over for dinner that evening, and so, as an afterthought, I decided to make Apple Pie for dessert. According to the H, this is exactly the kind of gung-ho attitude I have towards cooking which creates unnecessary stress for myself. Anyway, I found myself at my dining table about two hours later, sweating and swearing over shortcrust pastry dough, which refused to roll out the way it was supposed to, despite my best efforts. Why was it sticking to the rolling-pin and breaking up into bits and pieces? I blamed it on our humid weather. I blamed it on the fact that my hands were too warm because I was too excited. I blamed it on the dining table whose surface was just not meant to accommodate the rolling out of any sort of dough. What was I thinking anyway? In the midst of all this, my friends M and M, twins, dropped by to pick something up. I asked hopefully – desperately, I should say – if they had any idea what I ought to do. In response, they provided some encouragement and moral support. After experimenting with various methods (if we can call it that), and getting impatient with the non-cook, non-baker H for making suggestions which I was sure would not work, I took up one of his suggestions and put the ball of dough between two sheets of baking paper and ran the rolling-pin over it. And that did the trick. Because, as I have now come to learn, that is how it is supposed to be done. Duh. Mix flour, sugar and butter in large bowl. Rub together with fingers until pastry resembles fine breadcrumbs. Add just enough cold water to combine everything. Knead slightly, form into a ball, then wrap in cling film and place in the fridge for 30 minutes or more. Roll out two-thirds of the pastry dough on lightly-floured surface, reserving the other third in the fridge for the top crust. (Remember to save yourself the sweat – roll out the dough between 2 sheets of baking paper). The dough should be rolled out to such a size and shape that will allow it to cover the bottom and sides of a 1.5-inch high, 20cm-diameter round baking dish. Lay the rolled-out dough onto the pan, with sides coming up a little higher than the edge of the dish. (It has to be rolled out pretty thinly to fit). Sprinkle chopped macadamia nuts onto pastry base. Place pastry back in the fridge while apple filling is prepared. Put apples and water in large frying pan, cover and simmer gently, shaking pan gently occasionally, until apples start to become tender. Stir in sugar, lemon rind and cinnamon and remove from heat to cool. Remove chilled pie case from fridge and pack cooled filling into it. Roll remaining third of dough into a round the size of the pie dish top. Brush edges with a little water then press it together with the sides of the pie case to seal. Cut some slits in the top, and brush with beaten egg, before placing in preheated oven at 200 degrees celsius to bake for at least 30 minutes until top is golden and crisp.